When I was in the Galapagos Islands, I visited eight of its 18 main islands in eight days, and each of the eight islands was different from the other in landscape, fauna and flora. When leaving an island, I would think how could the next island compare to what I had seen and photographed, because each was unique and memorable. I could easily see why naturalist Charles Darwin spent five weeks in the Galapagos. Above is a view from Santiago Island. 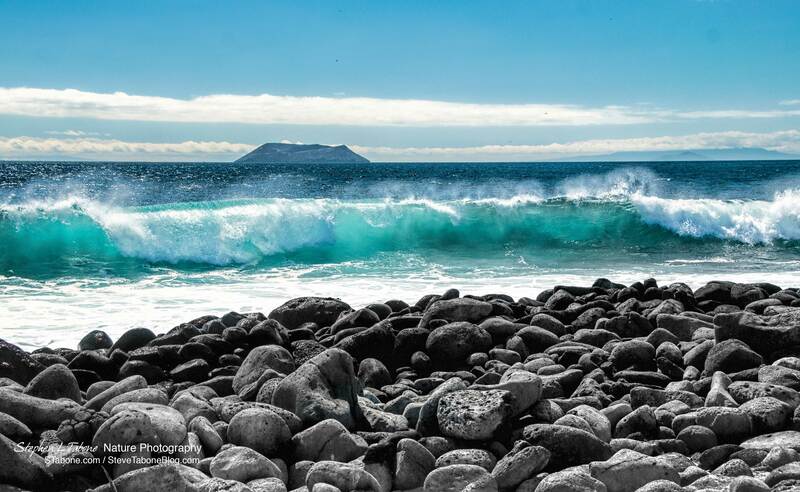 As you can see, the coastline is covered in large black volcanic rocks and boulders, and the water was a beautiful turquoise blue that glowed as the sunlight shined through large four to six foot waves. As shown in the above image, across the open water was an island formed from an old volcano that was leveled across the top when it erupted. Santiago Island was formed from two overlapping volcanoes. The last lava flow is estimated to have occurred about 750,000 years ago. 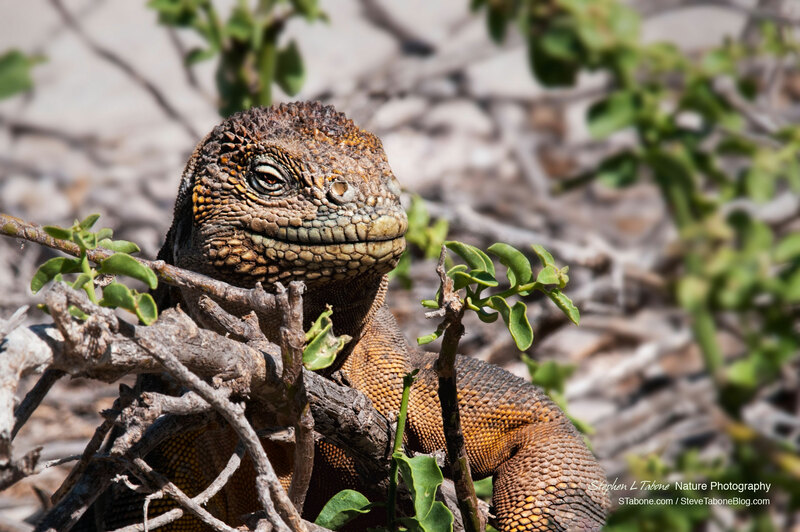 Besides the incredible views, Santiago is known for land iguanas, and it did not take long after landing on the island to locate the first iguana. The land iguanas looked very different from the many marine iguanas that I had seen on other islands and clearly looked prehistoric. The above photo is my favorite iguana image. 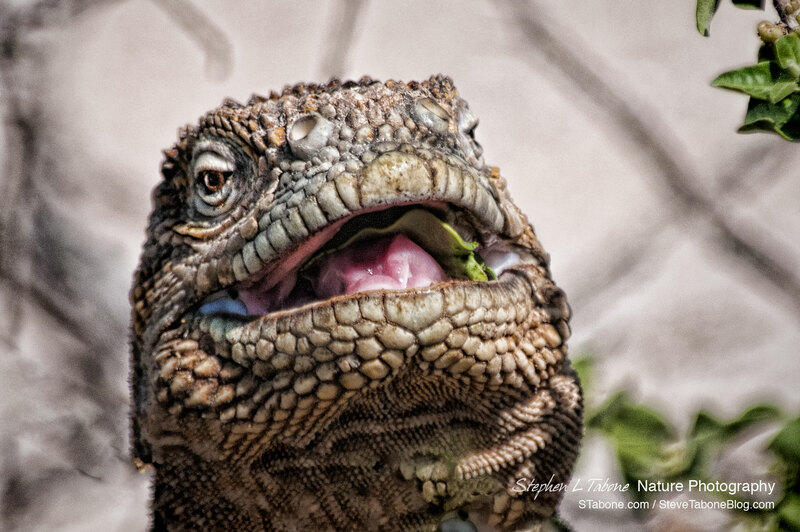 I shot it at eye level and caught the iguana looking at the camera with a grin. When Charles Darwin was on Santiago Island, he wrote that land iguana burrows were so abundant there was hardly room to pitch a single tent. Today, unfortunately, that is not the case. Because feral animals such as rats, dogs, cats and pigs were introduced on the island, the iguana population was at one time totally wiped out. Fortunately, they were reintroduced on the island, and although not as abundant as they once were, land iguanas can be seen again today. Galapagos land iguanas were described by Darwin as “ugly animals, of a yellowish orange beneath, and of a brownish-red color above: from their low facial angle they have a singularly stupid appearance.” I do not know why Darwin thought they looked stupid. I found them to be one of the highlights of the trip. In the above and below images, an iguana was working its way through the limited green foliage in an arid area of the island and eating leaves. Galapagos land iguanas grow to a length of three to five feet with a body weight of up to twenty-five pounds. They are cold-blooded and absorb heat from the sun by basking on Santiago’s volcanic rocks during the day. They spend evenings in burrows to conserve body heat. If you ever considered going to the Galapagos Islands and have not been there yet, I highly recommend making the trip. 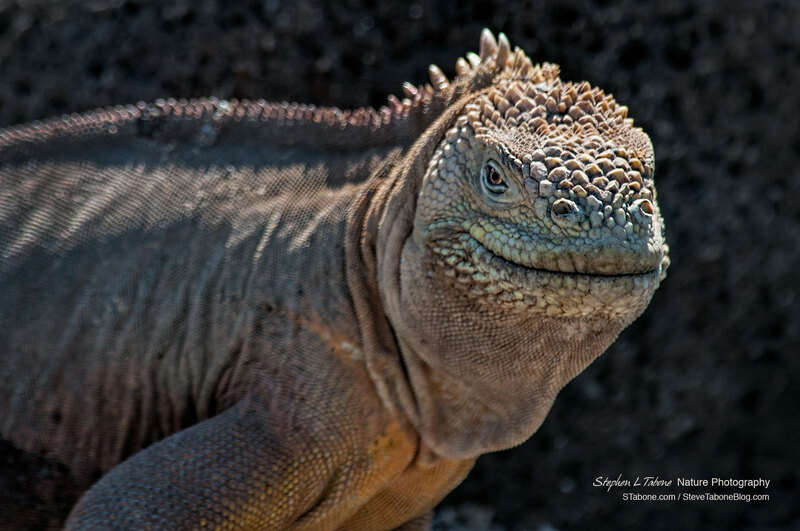 This entry was posted in Galapagos Islands, Nature and tagged Galapagos Islands, Iguana. Bookmark the permalink. Great pics! Love these iguanas! Outstanding! Even though I have known about this trip for a while, this is the first time that I have seen these images. They are wonderful! You certainly captured a different perspective than the typical shots that we see of these incredible animals. Thanks for sharing! Totally Cool! What a wonderful experience!